Looking for a quick delicious dinner? 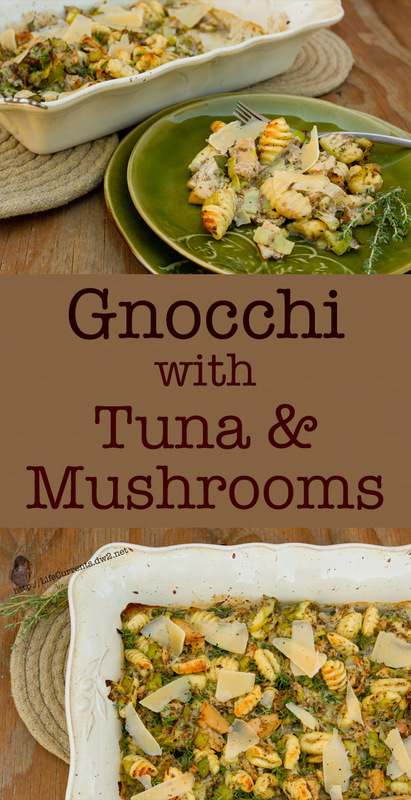 This Gnocchi with Mushrooms and Island Trollers Albacore Tuna is just the ticket. Hearty. Yummy. And pretty quick to make. Just a little chopping, browning, and baking, and boom! You’ve got a fresh take on dinner. When I make this I chop the mushrooms in a small food processor. I love mushrooms, but my husband isn’t such a fan of them. It isn’t the flavor he dislikes, it’s the texture. But, I’ve found that if I chop them up really fine, almost to a puree, he doesn’t mind them. If you want to try chopping them in the food processor, make sure to cut them in quarters first, otherwise they’ll just bounce around on the food processor blades. Preheat oven to 425 ° F. Lightly oil a 13x9 baking dish; set aside. In a large pot cook gnocchi according to package directions; drain. Meanwhile, heat the oil in a large skillet over medium high heat. Once oil is hot and shimmering, cook leeks until they begin to brown, about 5 minutes. Turn heat down to medium, and add mushrooms, garlic, and pepper, cooking until mushrooms release their liquid and begin to brown, about 5 minutes. Stir in milk and half-and-half. Simmer, uncovered, for about 5, minutes or until liquid begins to thicken. Fold in gnocchi, tuna, and any liquid from the tuna. Transfer to the prepared dish. Bake, uncovered, for 12 to 15 minutes or until lightly browned. Sprinkle with Parmesan cheese and thyme leaves. Let stand for 5 minutes. *If you’re making this recipe with Island Trollers Albacore Tuna, you don’t want to drain off those tasty juices from the can; they're the juices from the fish itself, not just plain ol’ water or oil. Those juices are loaded with Omega 3s. So, it might feel a little weird not to drain the tuna, but don’t do it.